Learning how to behave assertively is all very well but how do you deal with non-assertive behaviour in others? Every interaction is at least two-way, and learning how to deal assertively with others’ non-assertive behaviour is an important skill. The temptation is to respond aggressively or passively to other people’s passive or aggressive behaviour. This may be particularly the case if they make you angry. This page, however, explains how to deal effectively and assertively with both passive and aggressive behaviour. People often behave in a passive way because of low self-esteem or confidence. By behaving assertively, you should aim to make clear that the other person's contributions are valued, and therefore improve their confidence and self-esteem. Remember that it is possible to value someone's contribution without necessarily agreeing with it. As well as being more assertive ourselves, assertiveness should also be encouraged in others so that they can communicate their ideas and emotions freely without feeling under pressure to say certain things. Assertiveness in others can be encouraged by using well-honed interpersonal skills such as listening, questioning, reflection and clarification. Encourage their contribution through open questioning, by asking their opinions, and by drawing people into the discussion in group situations. Listen closely to what someone has to say before continuing the conversation. If necessary, use questioning techniques to clarify their opinion before responding with your own. See our pages: Listening Skills and Active Listening. Show that you are interested in what someone has to say through appropriate questioning, reflecting, clarification and summarising skills. See our pages: Reflecting and Clarification. 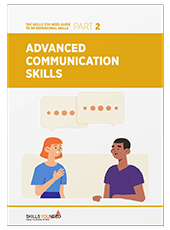 Show that you value the other person's contribution through the use of appropriate verbal and non-verbal communications such as nodding, smiling, good eye contact and encouraging language. See our page: Interpersonal Communication. Encourage people to be more open in voicing their feelings, wishes and ideas. See our pages Confidence and Self-Esteem. Do not allow yourself to take responsibility for decisions that should be made jointly. Instead, support others to make their contribution to the discussion. See our pages on: Decision Making. The more a person is able to contribute and feel that their contribution is valued, the more they will feel valued as an individual. The experience of positive feedback will help to increase a person's self-confidence. The whole chain of events should enable the person concerned to overcome any passive reactions and behave more assertively. If you know that someone tends to behave passively in a discussion or decision-making group, then take time beforehand to discuss their views with them. If you know how they feel, you can help them to express those views in the group. Handling aggressive behaviour in others is particularly difficult when it is accompanied by negative attitudes. To avoid responding defensively or aggressively, self-control is required. It should be noted that aggressive behaviour here refers to verbal and non-verbal messages and not to any form of physical violence. See our pages: Self Control and Dealing with Aggression for more information. Maintain self-control. Although anger can sometimes be a positive force, responding in a similarly angry manner will do little to discourage aggression. If appropriate, be prepared to take time to think over issues before entering into discussion. It might be helpful to say something like, “I need time to think about that” or “Can we talk about this tomorrow when we have more time?”. See our pages: What is Anger? and Anger Management to learn more about anger and how to deal with it, and Self-Control to learn more about how to remain in control of your own emotions. Remember that other people have a right to their emotions, including anger. Acknowledge their anger, for example, by saying ‘I can see that this has really upset you, and you’re very angry about it’. Pausing, or counting to ten, before responding to an outburst can help to avoid answering in an automatic, defensive or aggressive way. Avoid argument and defensiveness and try to maintain calm. Try to find areas of agreement with the other person, rather than focusing on the disagreements. See: What is Negotiation? for an introduction to negotiation skills. Try to show some empathy with the other person; how do you feel when you are angry with others? See our page: What is Empathy? Often it is difficult for a person behaving aggressively to calm down and see things from a broader point of view, since anger can be an expression of personal frustration. Using these techniques should help you to express yourself assertively rather than aggressively. This should help to defuse the situation and result in more positive and effective communication. Our page: Communicating in Difficult Situations offers further information on this topic, and you can find some helpful techniques for assertive behaviour on our page Assertive Tips and Techniques.